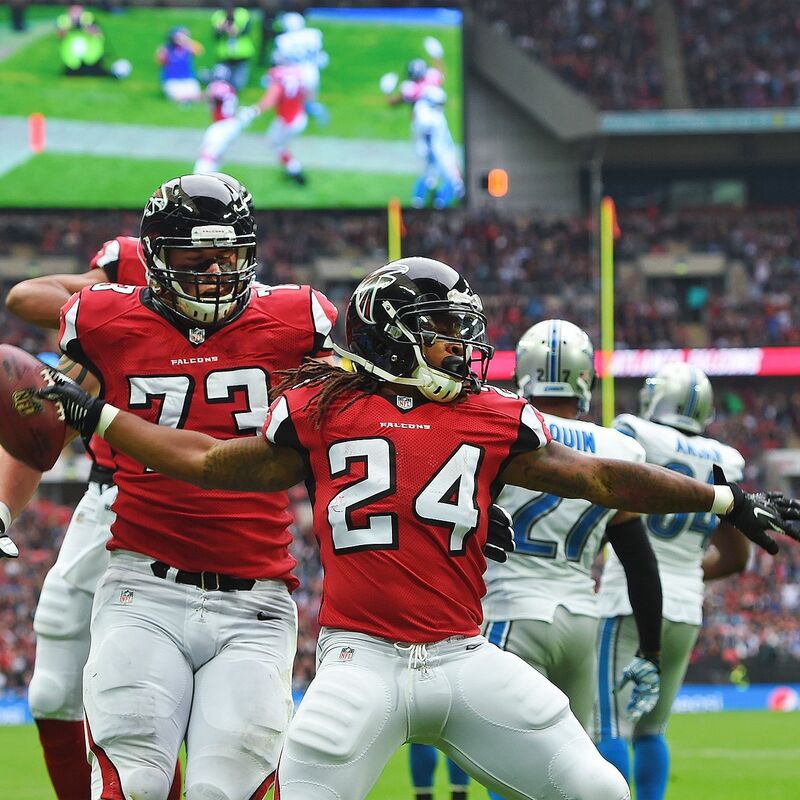 Devonta Freeman is a critical player for the 5-o Falcons. Photo courtesy of ESPN. It’s still a close fight for the NFC East division after week 5. The Giants lead by one win at 3-2. They defeated Colin Kaepernick 49er’s 30-27. Eli Manning had an impeccable game with 441 yards, three touchdowns and only one interception and wide receiver Odell Beckham Jr. had his best game of the 2015 season. He finished with seven receptions for 121 yards and a touchdown. He exited the game for a little with a hamstring injury scare, but returned a couple drives later. The Cowboys fell to the Patriots, which wasn’t a surprise as Dallas is playing without Tony Romo and Dez Bryant, they have to rely on backup quarterback Brandon Weeden. He finished the game with 188 yards, zero touchdowns, and one interception. However, Greg Hardy’s debut was semi-successful with two sacks and one forced fumble. Running back, Joseph Randle was only hit 4 times for 60 yards, not enough to make an impact. New England defeated Dallas 30-6, causing Dallas to fall to 2-3. Tom Brady threw for 275 yards, had two touchdowns and zero interceptions. To nobody’s surprise Julian Edelman came to play with 120 yards, one touchdown, with his longest run being 59 yards. In Philadelphia, Philly fans are fans of Sam Bradford again, for now. After this impressive win against the Saints 39-17, the Eagles advance to 2-3 fighting for second place with Dallas and Washington. Sam Bradford threw for 333 yards and had two touchdowns. DeMarco Murray was hit again, 7 times for 83 yards, and a touchdown. It’s safe to say that this win can be a huge thanks to defensive end Fletcher Cox. He forced two fumbles on Brees and sacked him a total of three times. The Washington Redskins fought hard against the undefeated Atlanta Falcons, but fell to 2-3 after the 25-19 loss. On Monday night, the fight between Pittsburgh and San Diego was neck and neck in the fourth quarter. Mike Vick had a terrible first 3 quarters, but lit up in the fourth. Le’Veon Bell had 4 receptions for 111 rushing yards, and one of the most important touchdowns of his career. With only seconds left, Bell was stopped by the Chargers defense right at the goal line, but extended his arm, and just barely got the ball in the end zone right before his knee touched. The Steelers had a victory win 24-20 over the Chargers on Monday Night Football, making for an interesting prime time game. The Charger’s tight end made his 2015 debut and completely annihilated. Antonio Gates’ suspension was over, and he made sure his return was acknowledged. He had nine receptions for 92 yards, and two touchdowns. That touchdown threw him in the category as the second tight end to ever catch 100 touchdowns, joining Tony Gonzalez who had 111. The Packers remain undefeated, although Aaron Rodgers’ streak ended against the Rams defense. He went almost 600 passes without being picked off, but on Sunday he only went 7 passes in between two. Sunday was bittersweet for Green Bay.